The "Dream Yurt" project series is designed to eradicate social barriers through the power of art and community, and in place celebrate kinship across our differences. By engaging/challenging systems of power, the project aims to transform systems of structured oppression and displacement while celebrating diversity, promoting social activism, equal justice, and inspiring social change. My name is Eriko Tsogo, I am a Mongolian American multi-disciplinary artist and community educator. I am also a DACA recipient and sexual abuse survivor. My sexual trauma history has profoundly affected and shaped my identity today. Sexual violence is a complex issue with many facets. It has always been a dream of mine to provide an avenue of sharing and healing for sexual assault survivors like myself. As part of the "Dream Yurt"project series, I was motivated to design and contextualize the Healing Yurt art workshop for the 2019 Denver Womxn’s March, “healing” used in a broader sense to not only help victims and survivors of sexual violence as well as to help alleviate any personal/social issues that need healing. I wholeheartedly believe in the power of the Healing Yurt art workshop to help inspire and instigate change for the individual/survivor and surrounding community. - The Healing Yurt project utilizes art as empowerment. - The healing yurt is designed to embrace the universal truths and struggles of the human condition. 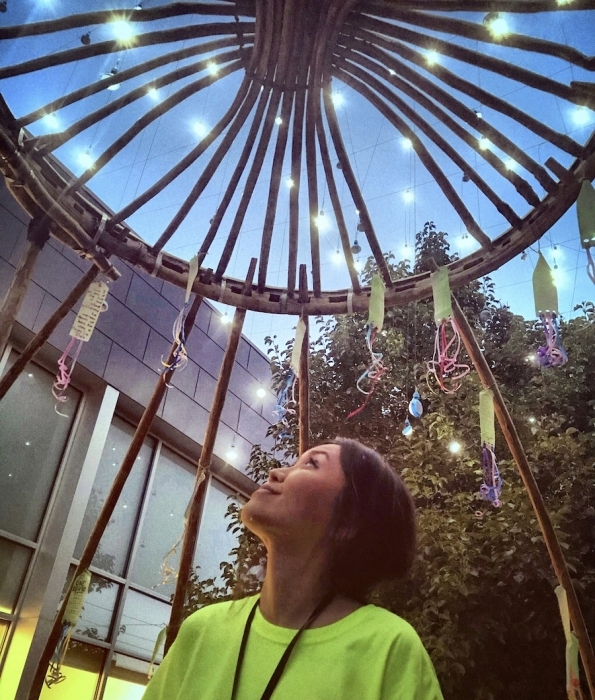 - The Healing Yurt is a call for social justice dedicated to the survivors of sexual violence. Alternatively, the space provides a platform for the victims of sexual violence to share their stories and be heard, some for the very fist time. - The Healing Yurt is inclusive to all who want to participate. - The Healing Yurt is designed to bring light to discerning women’s issues such as helping break the silence on violence/mistreatment against and about women. - The Healing Yurt is a conceptual “safe haven, non-discriminatory neutral healing container space” designed to distill, purify, heal, alleviate and empower any personal/social issues that need healing including trauma from victims of sexual violence through the collective power energy of the march crowd. - To promote discussion and awareness about women's rights and equality issues. - To end all forms of violence/mistreatment against women including sexual violence, victim blaming, and derogatory labels. - By showing the struggles we all face, help eradicate the rigid border of gender inequality and in place, help highlight the power of the human condition and the universal in all of us. - To cultivate community and diversity, peace through inter-cultural and inter-gender exchange. - Seeks to help empower and transform women through the power of empathy, inspiration and hope. - To celebrate the beauty in struggle and resilience, power of relativity over absolution. - To de-stigmatize sexual hypocrisy and self made assumptions, thereby engaging social justice and inspiring radical informed communities. The Healing Yurt project is looking for Host Collaborator Organizations and or Events in 2019, please contact erdensyren@yahoo.com for more information.